This was the world champion participating in a clown show, but if you're going to do this sort of thing then do it right. How the hell to do think of a spot like that Package Piledriver reversal and not make that the finish! That would have been the PERFECT finish for this match! The bell rings and the combatants start throwing strikes at each other... and of course we cut away to the announcers, because watching them sitting still is much more important than watching the wrestling match. I thought we had broken this atrocious habit? We're not even a minute in and Fale already has the referee in a headlock so that Tanga Loa can hit YOSHI-HASHI with a snap suplex on the outside. Putting the referee in a headlock did not result in a DQ. They actually then started to tell a story where YOSHI-HASHI would actually do really well against Fale but every time he had a chance to win Tanga Loa would interfere or cause a distraction that prevented him from capitalizing on his chance. Unfortunately some of this was done right in front of the referee with no DQ, but I did appreciate that they were actually using the interference to tell a real story instead of the usual just doing it for the sake of doing it. Then they ruined all of that by having Tama Tonga just run out and hit YOSHI-HASHI with a chair for the DQ. F*ck Gedo. POST-MATCH SEGMENT - Tama Tonga kept beating YOSHI-HASHI with a chair after the match was over. No one from YOSHI-HASHI's stable came out to help him. Not even Rocky Romero, who was sitting right there at the commentary table, who interfered to help Yano in a match last night, and who had told us that YOSHI-HASHI was a friend of his less than ten minutes ago. Tama Tonga then went into the crowd and started to choke a fan. Only one young-boy came out to stop this crazy person from hurting an innocent fan. This seems like a firing offense, no? Adam Page(4) vs. Minoru Suzuki(8) (w/El Desperado) - DUD! Once they're on the outside, the same old sh*t happens. Suzuki grabs a chair, the ref tries to stop him from using it but Suzuki shoves the referee down and uses it anyway but there still isn't a DQ. This time Kevin Kelly tried to claim that El Desperado was distracting the referee (all of which was off camera) but even if that were true, just shoving the referee down after he told you not to use a weapon should be a DQ. Then, just to make Kevin look stupid, we got Suzuki picking up a chair, the referee telling him not to use it and Suzuki hitting Page with the chair anyway but there still wasn't a DQ. If this was a Firing Squad match, the referee would have surely ordered the bell rung by now, so why is Suzuki allowed to get away with all of this? Actually, it's not just Suzuki; Yano has hit people with things you're not supposed to hit people with and gotten away with it, as has Naito, as has EVIL. What gives? It's okay when the Japanese do it but not okay when Tongans do it? I think New Japan could well have a racial discrimination lawsuit on their hands over this. Suzuki then went to get a guardrail and hit Page with it. The referee didn't see this because Suzuki's second, El Desperado, HAD HIM IN AN ARMLOCK. HOW THE F*CK IS THIS NOT A DISQUALIFICATION? Suzuki walked back to ringside and the referee followed and scolded him, so Suzuki now because to manhandle the referee. Again: HOW THE F*CK IS THIS NOT A DISQUALIFICATION? Obviously the answer is C, because that's the thing that makes the least amount of sense. 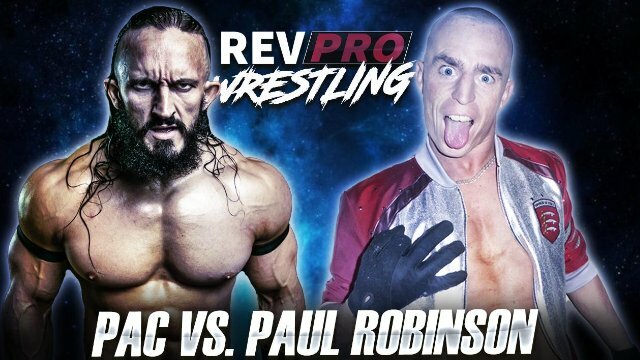 The get back in the ring and trade some pie-faces and shoves that I'm sure were supposed to come off as intense, but how can anything come off as intense when they've made this such a farce? They start trading strikes and it ends in a double-down and now the referee has the gall to check on Adam Page to see if he's okay. If you were so concerned about Adam Page's health then WHY DIDN'T YOU DISQUALIFY THE MAN HITTING HIM WITH AN ILLEGAL WEAPON, YOU USELESS TURD-BAG?! They finally started having a good match for a minute or two, with Suzuki working over Page's arm with some nasty-looking submissions but Page got to the ropes, so Suzuki broke the hold. WHY? If the referee wouldn't disqualify him for using foreign objects, attacking the referee, or having his second attack the referee, why would anyone- especially Suzuki- think the referee would disqualify him for not breaking in the ropes? And even if the referee did disqualify Suzuki, so what? Gedo's sh*tty booking already eliminated Suzuki from the tournament after his loss to Okada on day 13, so it's not like Suzuki even has anything to lose here for taking that risk (I mean... technically he can still win if everything goes right for him, but it would involve a five-way playoff that I detailed in my review of last night's show. But the announcers were insistent that his loss to Okada eliminated him from the tournament, so I guess we can got with that. Either that or the announcers should be criticized for not thinking out all of the possibilities, but I'm burying Gedo at the moment, not them so that's who will go with). 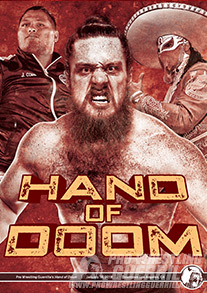 Anyway, they're back on their feet and now trading forearms, and of course Page isn't selling his arms at all anymore, despite the work Suzuki was doing on them just moments before. The last two or three minutes of this actually had some really good stuff in it, but 99% of what came before was just so f*cking stupid that I cannot give it anything higher than a dud. In a way, those flashes of greatness almost makes this match even more frustrating because I now can't help but think of how great this match could have been if instead of doing the same stupid, tired old Suzuki-Gun bullsh*t and turning it up to a million, they had actually tried to have a great professional wrestling match. I'm sick and tired of Suzuki-Gun matches; I want Minoru Suzuki matches. White was doing his usual running his opponent's back into the barricades on the outside (while the referee wasn't counting anyone out, of course), then posed arrogantly. This prompted Rocky Romero to angrily shout "IT'S NOT ABOUT YOU!" over and over again at Jay White, which in turn prompted me to shout "Yes it is, Rocky! He's the wrestler!" They had a match that was very good until the frustrating, predictable ref bump and cheating. It's MAKABE! I'm probably his biggest fan and even I have no delusions that he needs to be protected. If you're going to push Jay White, GIVE HIM AN ACTUAL CLEAN WIN FOR ONCE! You let Adam Page beat Makabe clean so why not Jay White? Hmm. 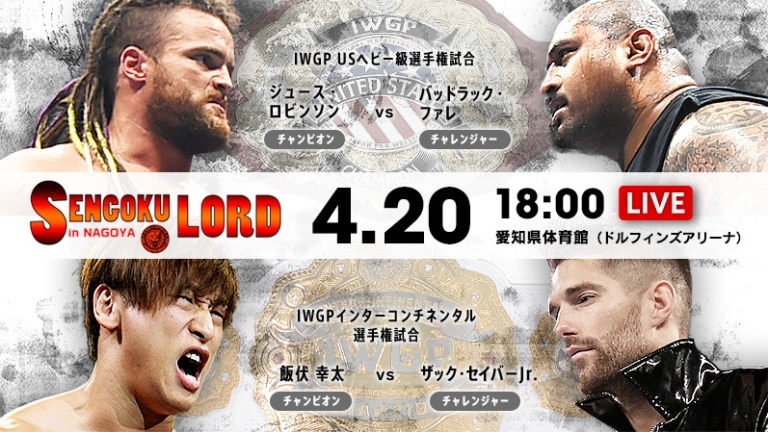 We could either have Elgin win here to create a situation where we can have Okada put EVIL over or go to a draw with him in the main event while still being alive one the final day, or we can put Tanahashi over and basically spoil the result of tonight's main event. What do you think we should do, Gedo? We started off with EVIL giving Okada clobbering. He eventually got a chair and used that on Okada right in front of the referee but there was no DQ for this. He kept working over the head while Okada got some shots in on EVIL's head as well. EVIL did some big thing off the apron into the guardrail, which led to EVIL dragging Okada all the way to the ramp to try to hit Darkness Falls on the ramp. Dude... just hit it in on floor! It won't be that much less damage, and it won't give Okada a bunch of time to recover. Once they were back in the ring, things started to get very good. EVIL finding a way to use the ref for an assisted Magic Killer was very clever, though Red Shoes somehow taking a bump off of it made no sense. The using of each other's finishers was done very well, and was set up well last night, marking a relatively rare occasion in this G1 that the "build-up" tag match has actually led to something important in the G1 match itself. The storytelling in this match was pretty great, but the combination of the silly refereeing and the booking took away from it, especially because the booking killed all of EVIL's nearfalls. 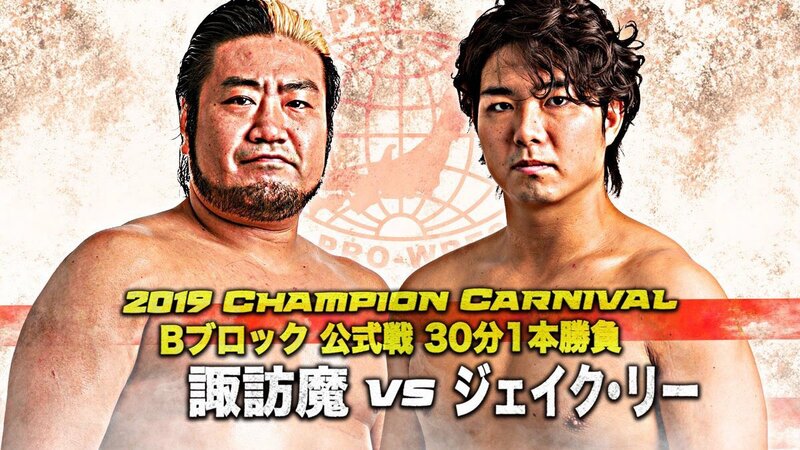 This was yet another frustrating G1 show, severely damaged by overbooking, atrocious refereeing, and Gedo's usual bad, patterned tournament booking. I'm sorry for harping on this, but I just find it so baffling. The scenario coming out of tonight's show is as follows: White and Okada have twelve each and Tanahashi has fourteen, with White having the tie-breaker over both of the others, and Okada and Tanahashi facing off in the main event of the final Block A show. If White doesn't beat EVIL, then Okada and Tanahashi will face off with Okada needing to win in order to win the block. If White does beat EVIL, then Okada and Tanahashi face off with an Okada win meaning White wins the block and anything else meaning Tanahashi wins it. But if Tanahashi loses tonight and Okada wins you can create almost the same situation except with the possibility that if White draws against EVIL (which you would obviously have him do in this scenario) then Okada and Tanahashi are fighting each other for the win, but if they go to a draw then Jay White wins... and when you consider that these two haven't had a singles match that went less than thirty minutes in over six years and that both of their G1 meetings have resulted in thirty-minute time-limit draws, creates a hell of a story. 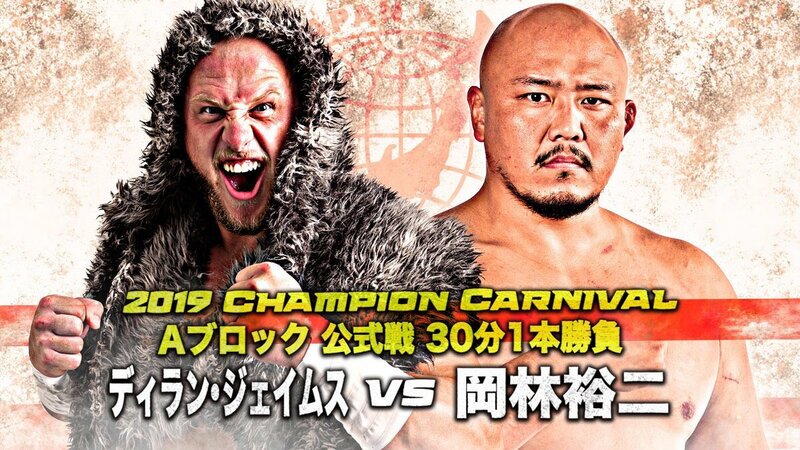 Or if you like the current set-up so much, how about this scenario: Flip everyone's expectations on their head by White get caught cheating in his match against Makabe and lose by DQ. If you wouldn't put the guy over Makabe clean then you shouldn't really have a problem having him lose by DQ as you're still protecting him. After all, that seems to be Gedo's entire philosophy with the Firing Squad this tournament, right? 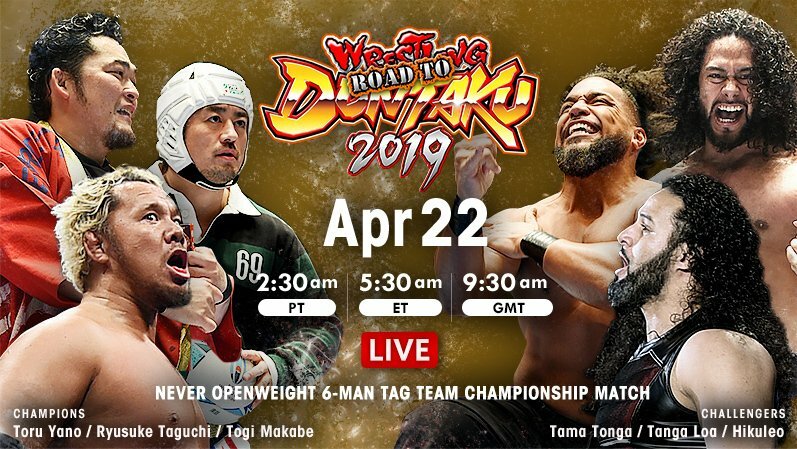 Then I would have YOSHI-HASHI pull off some kind of crazy roll-up upset win on Fale right before the Guerrillas interfere, just to avoid doing to DQs on the same show and to surprise people on the finish there. Then you could have both Tanahashi and Okada lose here. You get the same exact scenario as we have right now, but everyone involved has two fewer points. The real difference, though, is that by having EVIL beat Okada for the second year in a row instead of lose to him, you're setting yourself up to tell a story about EVIL being Okada's big G1 stumbling block which you can pull out of your bag whenever you need. 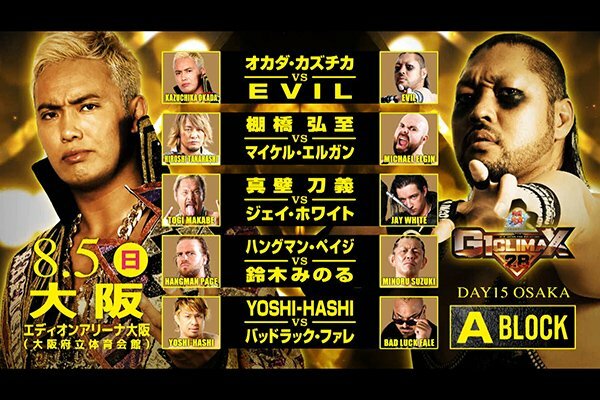 Or for the love of G-d if for some reason you MUST book this all exactly as Gedo has booked it, at least change the order tonight's matches so that Elgin vs. Tanahashi is the main event so that you not only don't spoil the result of Okada vs. EVIL but also so you can have the announcers push that the Tanahashi vs. Elgin match is about Tanahashi "fighting for control of his own destiny" so that by staying ahead of White there is no scenario where White can just win his match against EVIL and clinch the block no matter what the result of Tanahashi vs. Okada is.